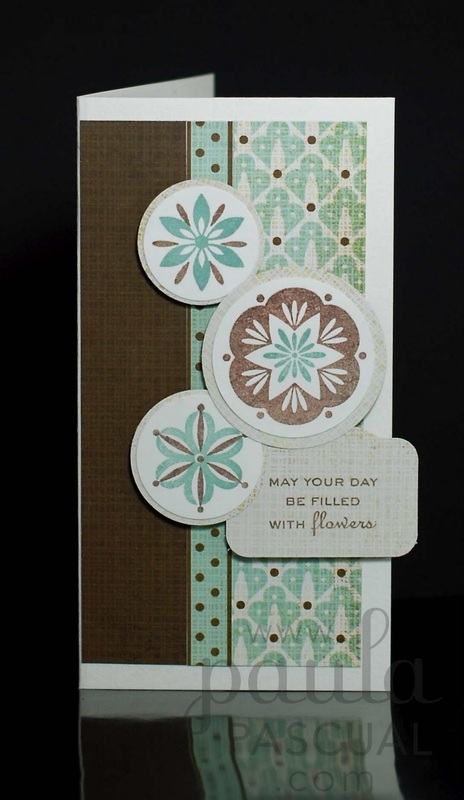 This card is part of a set I did for the QVC kit that features the Filled with Flowers and Simple Flowers set. 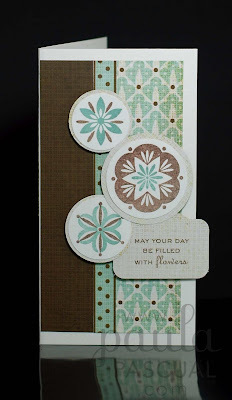 I used some Basic Grey papers as the background, from the Nook and Pantry collection. Since I took those photos I have got some pro lighting, nothing too flash, just simple off camera flash but hopefully that will mean that card photos will improve in terms of lighting. I am trying desperately to go back to some kind of routine that will allow me to juggle all the aspects of my life. I don't do anything big, just bits and pieces here and there that are rather distracting sometimes. I'm very happy you have posted a card Paula. I miss them! So pleased I have these stamps Paula, and thanks for another great idea.Katy. Lovely colours Paula and a great card of course.